Flushed Away Movie Someone's Going Down. 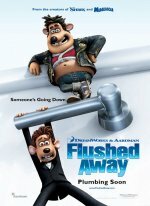 Flushed Away release date was Friday, November 3, 2006. Roddy is a decidedly upper-crust society rat who makes his home in a posh Kensington flat, complete with two hamster butlers named Gilbert and Sullivan. When a common sewer rat named Syd comes spewing out of the sink and decides he's hit the jackpot, Roddy schemes to rid himself of the pest by luring him into the whirlpool. Syd may be an ignorant slob, but he s no fool, so it is Roddy who winds up being flushed away into the bustling sewer world of Ratropolis. There Roddy meets Rita, an enterprising scavenger who works the sewers in her faithful boat, the Jammy Dodger. Roddy immediately wants out, or rather, up; Rita wants to be paid for her trouble; and, speaking of trouble, the villainous Toad who royally despises all rodents wants them iced literally. The Toad dispatches his two hapless hench-rats, Spike and Whitey, to get the job done. When they fail, the Toad has no choice but to send to France for his cousin that dreaded mercenary, Le Frog.